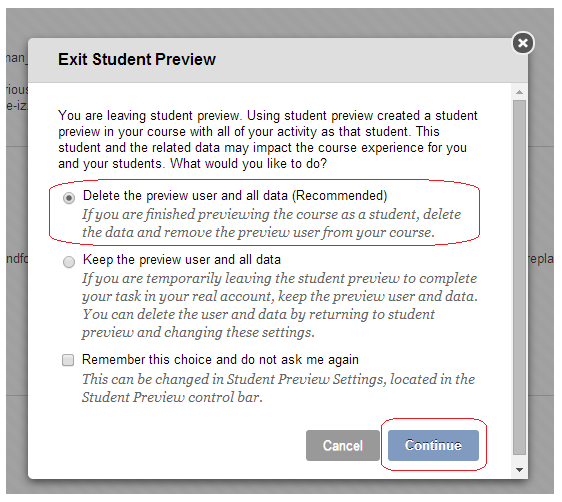 Student preview is a feature that allows Blackboard course instructors to review their course in the exact same way as a student. While Edit Mode set to Off would give a very good idea of how the student would see the course, Student Preview will create a temporary student account on the course so that the instructor will see exactly what a student sees. This includes the ability to take tests and receive results. When Student Preview is turned off the instructor is asked whether they wish to keep the data generated by this temporary student account. To avoid possible confusion in the future this data should always be deleted. 1. 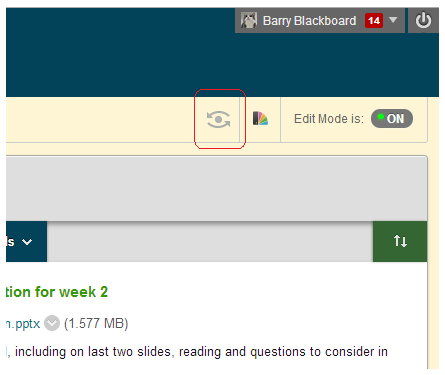 From within your Blackboard course click on the Student Preview icon which looks like an “all seeing eye” at the top right corner of your course window, next to Edit Mode. 2. Student Preview will be turned on. An orange bar along the top will be shown reminding you of this. 3. You may use your course as a student. 4. When you have finished click on Exit Preview. 5. You will be asked if you wish to have the data that was generated while within Student View deleted. Choose to Delete the preview user and all data and click on Continue. 6. You will be returned to your usual instructor view of the course. The Review Status tool allows you to track whether students have reviewed specific content items. Once the you enable the tool for an item, each student may tracks their progress. A Mark Reviewed button appears on the item when the student opens the Content Area. After reviewing the item, the student may select this button to mark it Reviewed. You can check the status of student reviews on the User Progress page. 1. Begin by identifying the content item for which you wish to enable “Review Status”. 2. Click on the modify button and choose review status. 3. Select Enable and click on Submit. If you expect your students to mark material as reviewed make sure they are aware of this. Otherwise only a few may do so. 4. To see which students have marked the item as reviewed. Click on User Progress from the Modify button menu. 5. A summary is displayed showing to whom the content is visible, and which users have marked the item as reviewed and when they reviewed it. 6. 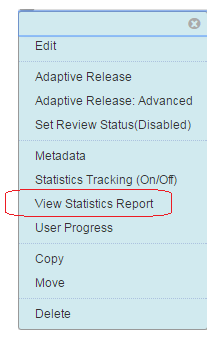 When a student sees and item with Review Status enabled a button is displayed showing “Mark Reviewed“. 7. When a student clicks on Mark Reviewed, the button changes to Reviewed. It is possible to Copy or Move material within your Blackboard course or between your Blackboard courses. 2. Find the content item that you wish to copy or move. 3. Click on the Modify button beside it. 4. Choose Copy or Move according to your preference. 5. 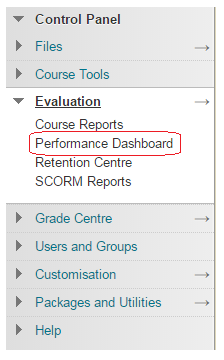 If you wish to copy or move the material to a different Blackboard course then select it from the Destination Course dropdown menu. 6. Click on Browse to choose where you wish to copy / move the material within the selected course. 7. A map of your course will appear, use this to select the area to which you wish to copy or move the material. To select the destination simply click on it. Adaptive Release allows you to make Blackboard course content available to students only when they have fulfilled certain criteria. Basic Adaptive Release allows for a rule to be created based on limited criteria, while the advanced function allows for multiple rules to be used. Use the advanced features when you have an understanding of the basic ones. We recommend before using this feature with students that you experiment first with a colleague who is enrolled on your course as a student to make sure any rules you create work as expected. Use this guide to find out about the basic Adaptive Release feature in Blackboard. Once you have an understanding of basic usage, read this guide to find out how to make more advanced Adaptive Release rules. Adaptive Release of Content provides controls to release content to users based on a set of rules you create. The rules may be related to date and time, individual users and groups, scores or attempts on any Grade Centre item, or review status of another item in the course. Advanced Adaptive Release allows you to set up more than one rule, with each rule being able to contain a number of criteria. However note that the rules cannot be used together e.g. Rule 1 AND Rule 2, rather it will use Rule 1 OR Rule 2. For example, if different rules apply for different Groups in a course, Advanced Adaptive Release is used. The Instructor may set up a rule for Group A that enables all users in the Group to view an item once they receive a score of 85 on a Test. The Instructor may set up a separate rule for Group B that enables them to see the same content item after they receive a score of 80 on the Test. 3. You should see a set of options like the one above. Click on Adaptive Release: Advanced. 4. Click on Create Rule. 5. Type in a name for your rule, or use the one provided. 6. Use the buttons along the top of the screen to add criteria to make your rule. You can use the same criteria more than once, for example several grade centre criteria all requiring 70 marks or more on a number of tests. To apply a date restriction. To apply a membership restriction e.g. by username or group. Use this rule to restrict access according to grade centre criteria. Use this rule to apply a “Review Status” criteria. Refer to the guide to Basic Adaptive Release Rules for more information about these criteria. 7. Once you have added the criteria to your rule according to your preferences you will be taken back to the screen showing all of the rules, where you can add further rules if you wish. Note that the rules will be used separately, i.e. Rule 1 OR Rules 2. 8. To see which material is viewable by students, click on User Progress from the Manage options page. 9. This screen shows content availability to each student on your course. A closed eye icon means the content is not currently visible to the student, while an open eye icon means the content is visible to the student.